Rupert had always disliked the appearance of his smile – the bane of his life a front tooth that was hidden behind the others. 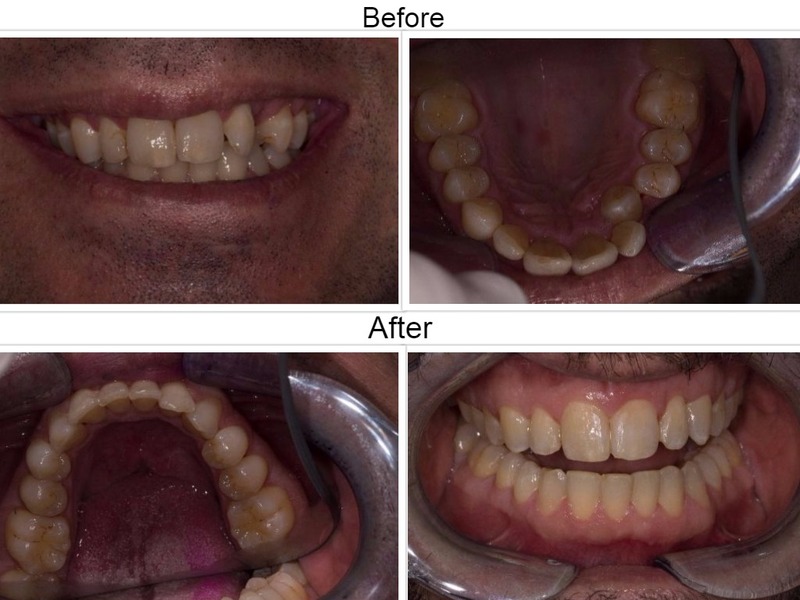 The 42-year-old felt this instanding tooth – that had an inward tendency – spoilt his smile and consulted cosmetic dentist David Bloom to find out what options were open to him in order to fix it and create a new smile. Little did he realise, there was a simple solution that would only take a few months to address. David recommended Cfast cosmetic teeth-straightening treatment and Rupert proceeded with the labial option. Cfast is an innovative cosmetic orthodontic procedure that straightens the front teeth, producing aesthetic results in as little as eight weeks – and at an affordable price. It is not a replacement for conventional orthodontic treatment, but focuses on just the front six teeth that show when we talk and smile – aka the ‘social six’ – and involves simple corrections that can be carried out easily by an accredited Cfast dentist. Now Rupert’s teeth are aligned, David and his team are carrying out teeth whitening, using Enlighten, and edge bonding, using a tooth-coloured composite resin to tidy up the edges of his teeth. Cfast stands for ‘Cosmetically Focused Adult Straight Teeth’ and is an orthodontic system designed to discreetly and quickly straighten teeth. The fact that the treatment only focuses on the front six teeth is the reason it’s rapid, and, if you choose the lingual braces or clear aligners, then it can also be invisible. While wearing your Cfast braces, you will need to see your dentist about once a month to check your progress and make adjustments and, as with any kind of braces, there will be some initial discomfort as you get used to wearing them. Speech will be affected for the first few days, too, and lingual braces and clear aligners can take a bit longer to adapt to as they interfere with the position of the tongue. You will need to be careful with your diet to avoid damage to your teeth or the braces during treatment. This includes avoiding very hard or very sticky foods. It is also advisable to limit the amount of sugar and fizzy drinks. The good news is that if you choose the clear aligner option, these braces can be removed to eat so there is less restriction on your diet. And don’t forget, after any kind of brace treatment it is very important to wear retainers, without these your teeth can move out of line again. Both fixed and removable retainers are advised after treatment, which is why Cfast recently introduced the SOLID dual invisible retainer. The SOLID retainer system stands for Single-visit Orthodontic Lingual and Invisible Dual Retainer System and combines an invisible fixed-lingual retainer with a removable acrylic retainer. The Cfast SOLID Retention System satisfies advice from members of both the British Orthodontic Society and American Association of Orthodontics who recommend provision of fixed-lingual and removable retention for more security in limiting the potential of orthodontic relapse.